“But you (Bethlehem) Ephrathah, the least of the clans of Judah, from you will come for me a future ruler of Israel whose origins go back to the distant past”. It is possible, even within serious difficulties, to remain trusting, loving and even cheerful. I know a fairly young parishioner, who is seriously ill with cancer, and the weaker and more debilitated he becomes, so his spirit seems the stronger. He puts this down to the power of God, not really being able to explain it. In fact, there may be no other reasonable explanation. Knowing Jesus is our salvation. ‘Knowing a person” means not just intellectual knowledge, but is so much more concerned with our very human instincts, our innermost feelings – our whole being. According to the Scripture, we know the person of God through the forgiveness of our sins. This is why a person once said to me, that after celebrating Reconciliation, they felt they ‘floated’ as they walked home. Please be assured, there is nothing remote about this; it is something intrinsically personal and essentially intimate. “I wish you and the family joy: the joy of looking forward to meeting old friends; the joy of being with people who love you and care for you and whom you love and care about; the joy of realising that there is a God who believes in you and who cares about you, and who loves you very much! Have a pleasant and happy Christmas. This text almost completes the ‘circle’ of this blog, for it brings us back to the homely love of family, with the Holy Family as our model. However, there is one further connected thought that I wish to put to you and this concerns our Holy Father, the Pope. Finally, in wishing everyone a Happy Christmas, it is worth knowing that Pope Benedict will be doing “Thought For The Day”, at 7.45 am, on Radio 4, during the “Today programme” – the first time a Pope has ever done this. The Christmas card above has come from the Vatican, and so I share it with everyone. 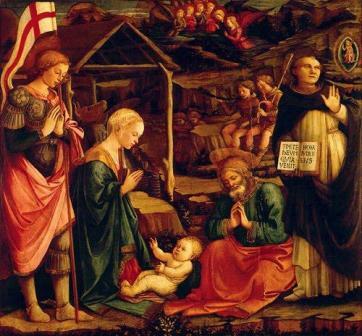 It shows the Holy Family and seems to point to the Holiness of God, by means of the reverence in the postures of Mary and Joseph, the person holding the Cross of St. George, St. Dominic with his sign in Latin that says: “Fear God whose hour is coming” as he sees the devil over his shoulder, the shepherds, and even the angels in heaven. Pictured here is the origin of our Redemption and God is very close. 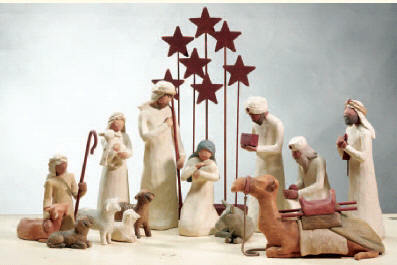 God bless us all at Christmas!